A delicious mustard cream sauce enlivens peppered pork chops. 1. 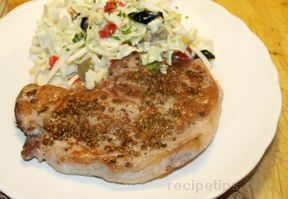 Sprinkle pork chops with 1/2 teaspoon each Worcestershire Pepper and salt. 2. Heat oil in large skillet on medium-high heat. Add chops; cook 4 to 6 minutes per side or until desired doneness (if chops brown too quickly, reduce heat slightly). Remove skillet from heat. Transfer chops to serving platter; cover and keep warm. 3. Stir wine into skillet, scraping to loosen any browned bits. Add cream, mustard, sage and remaining 1/2 teaspoon Worcestershire Pepper and 1/4 teaspoon salt. Bring to boil on medium heat. Reduce heat to low; simmer, uncovered, 2 minutes or until reduced to about 1/2 cup. Serve sauce over chops.